This elegant adult only vacation complex located in Playa de Paraíso on the Mexican Riviera in an area of plentiful tourists attractions. Experience the luxury of this 5-star all-inclusive hotel complex that includes three incredible swimming pools with concierge service, a spa, 2 buffet restaurants, 4 themed restaurants and a variety of bars. There are numerous sporting activities from which to choose. 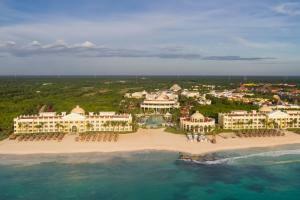 Located on Playa de Paraíso, a popular tourist destination on the Mayan Riviera in Mexico. Just 20 minutes from the Cancun International Airport. Night clubs, shopping malls, interactive dolphin aquarium, Xcaret eco-archeological park, Xel-ha, Tulum, Chichen Itza, deep sea fishing, Isla Mujeres, Cozumel and many others.